To place an international order, or for more information on NexPak or our other medical technologies, please contact our customer service department at +1 (866) 612-2568. 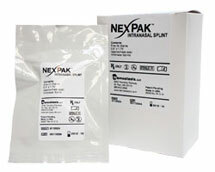 NexPak is packaged five (5) sterile units per carton. One (1) sterile unit contains one (1) intranasal splint. NexPak is terminally sterilized by gamma irradiation. NexPak Intranasal Splint should be stored at room temperature. Once product package is opened, contents may be subject to contamination. Discard any unused product after opening.